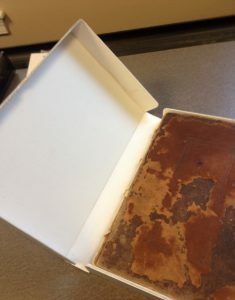 There is a regular supply of record volumes coming in and going out, and for those volumes in need of conservation, a lot can happen as they are prepared for scanning. Our Conservation Lab has received many volumes in seriously poor condition. Take, for example, this volume from Saint Patrick’s in Lowell, Massachusetts. It contains marriage records from 1836 to 1872. Unfortunately, the paper used in this volume, and in many others, has aged poorly. I should add that the writing on some of these pages goes right up to the gutter and to the fore edge of the page. (There was nothing wasteful about these record keepers.) 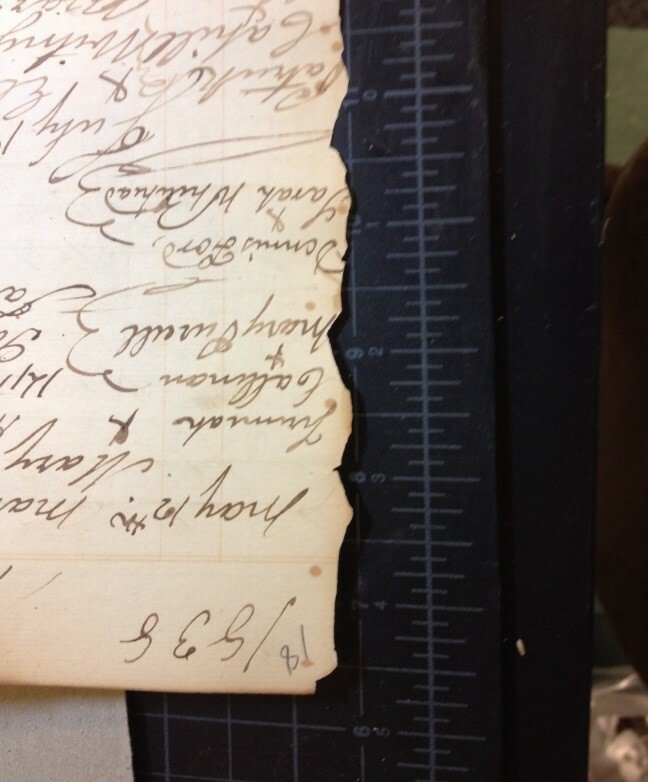 However, this manner of writing poses a serious problem when one wants to scan the pages. We don’t want to take a chance of breaking any text off the page. So how exactly do we treat these particular books? 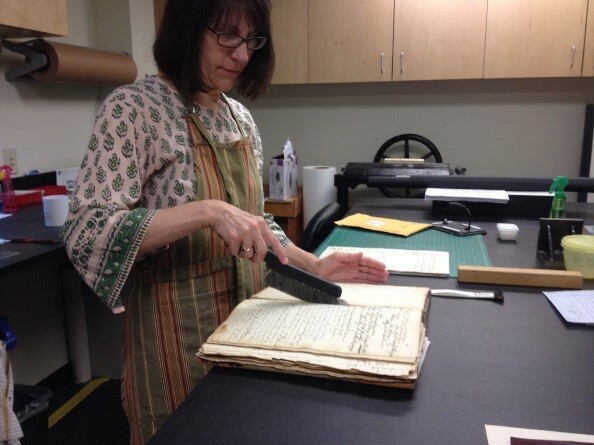 Our volunteer Dianne Wesselhoeft uses a static dissipating brush to collect the pieces of paper and dust from the gutter of a Saint Patrick volume. Well, first off, the technician checks for loose pieces that have broken off the edge of the page and collects what is salvageable and separates those from what small pieces are disposable. Then comes the matching game. It’s not always easy to find where a piece used to fit along the edge of a page, especially when you’re dealing with a sea of bits of paper. And why did this happen in the first place? There are, after all, pages that are still sewn into the book and whose paper is without loss. The answer lies within the last sentence. That is, because certain sections of the book remained sewn in place, they remained free of damage. Loose pages sometimes stuck out beyond the protection of the cover. If the paper had been made of rags, linens, or cotton, the paper most likely would not have broken away from the sewing. The sewing in the book is still intact. The fault lies in the breakdown of the cellulose fiber of the paper. [Because] certain sections of the book remained sewn in place, they remained free of damage. The next question is, how do we make the pages user-friendly enough before we proceed with scanning? The traditional method is to use a high-quality mending paper such as Kizukishi. It is adhered with wheat paste such as zen shofu, and the consistency of the wheat paste needs to be rather thick – more so than the usual consistency we use, which is more like soupy Cream of Wheat. Page being repaired with heat-activated tissue. Why thicker? Because if the paste is too wet, when the mending paper is applied (with wheat paste brushed on), it may cause tide lines. The tide lines are the brown lines that come through when moisture contacts the old paper, moving both accumulated dirt and sizing across the page. It looks bad and would further detract from the scanned image. As an alternative to thicker paste, we can use a substitute paper – Crompton Coated Tissue. This paper has a glossy and a non-glossy side, and is pH neutral. In the image at left, Dianne is using a tacking iron (a mini iron) and, with the glossy side face down on the page, she applies heat. The majority of pages require that three sides of the page be lined with the heat-set tissue. For the Saint Patrick’s volume alone, there were approximately 85 pages to edge out. That’s a lot of ironing, and it took us two-and-a-half days to complete. But now the Saint Patrick’s volume is ready to scan. Once the scanning is complete, this volume will return to the lab so we can create a box for it. The box is a very simple but sound and utilitarian Phase Box, which is custom made for the size of the volume. For the spine of the box, a label is created which identifies the parish, its location, the type of records, and the dates of the records. 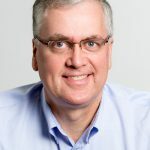 At this point, the volume can safely be returned to the Archives of the Roman Catholic Archdiocese of Boston, where it will be carefully stored. Researchers will have access to the online images of the records, reducing the handling of the original volumes and helping to avoid any need for additional conservation. This is a wonderful project. Thanks for this insight into the process and bravo to all involved. It is great to see that this project is both digitizing the existing materials and taking steps to preserve the original documents for posterity. When will the Lowell records be available on-line, my maternal great great parents should be in there. 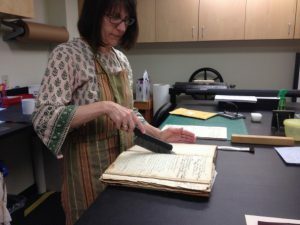 Three of the St. Patrick’s in Lowell volumes have been scanned, while two are still going through the conservation process. We will release the entire parish once the whole volume has been scanned. I can’t give you an exact date for when it will be ready, but you can always subscribe to dbnews.americanancestors.org where we post our updates as they happen. Fascinating and useful technical info. It helps me understand conservation better, and how much expertise is required. But also, it reminds me why so much was thrown out because it “looked useless”. 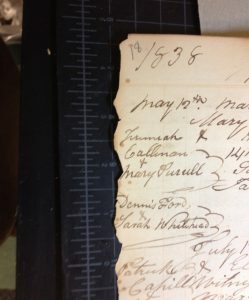 I know my family’s Bible from the early 19th century was photocopied at the corner store, really badly, illegible in most places, and tons of valuable documents you can see sticking out the edges (tenant receipts to Irish landlords, carting ledgers, with names) were not even considered worthy of copying. Various 3rd cousin relatives have copies of copies of copies of that bad xerox, and the original bible was taken by a vindictive divorcee and now lost. That all is bad, but it is the equivalent of fixing one edge of one primary document, of retaining every portion through tedious but magnificent work! The value it could mean to a line of genealogy is beyond reckoning. I loved this blog entry! Valuable work! Thank you for explaining how the pages are made ready for scanning. Details like the static dissipating brush are wonderful. Marvelous work! The treasures that these records hold have already broken down a few brick walls for me. 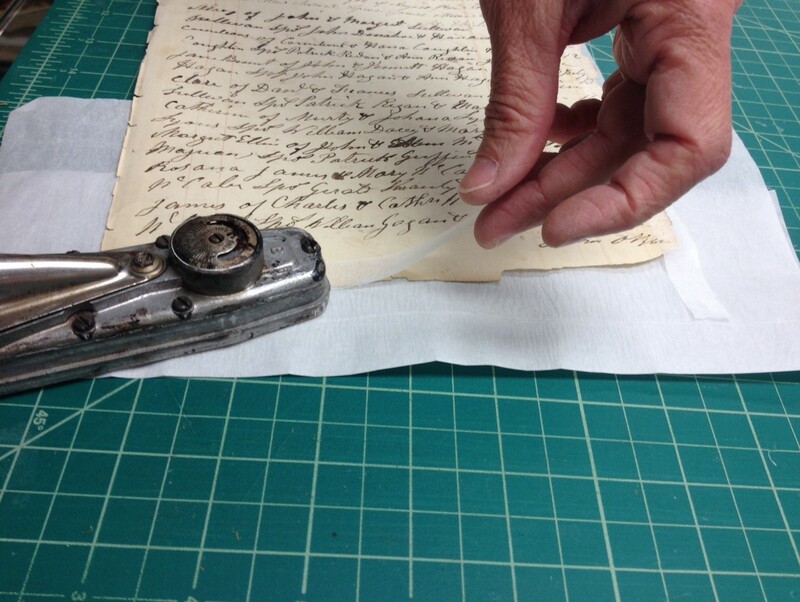 Thank you, and the Archdiocese archives for sharing and preserving them.